Kissel has been a popular Eastern European desert for hundreds of years. Some of my earliest childhood memories involve eating sweet warm kissel. There are many variations of kissel, now including my Banana Berry Kissel Recipe (кисель). Some people strain the fruit in kissel so it’s like a thickened juice, others make with cranberries, blueberries, cherries or red currants. We always had homegrown berries, such as strawberries, raspberries, blackberries, blueberries, even cherries. 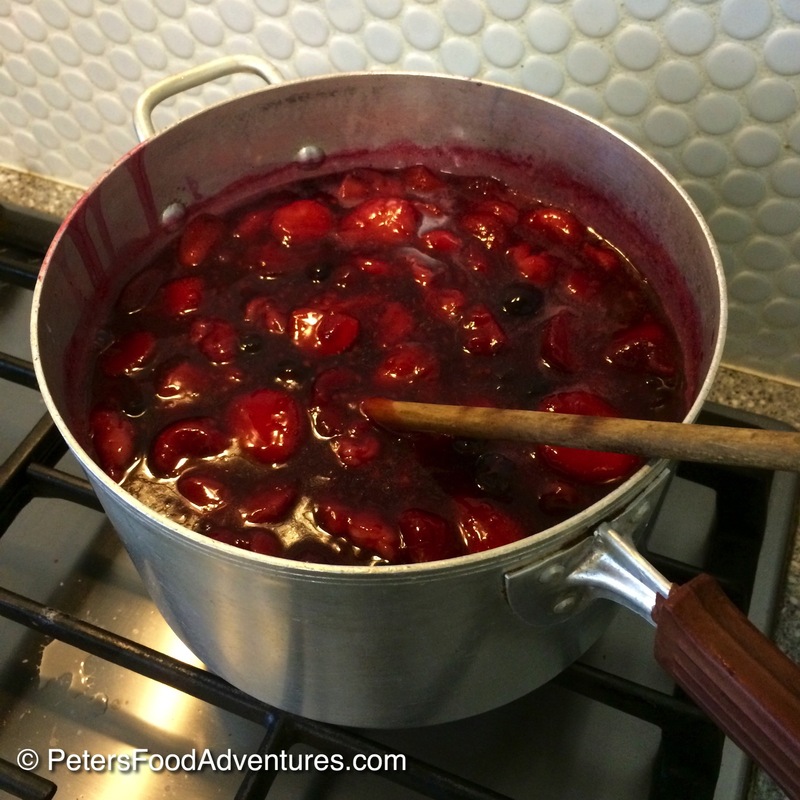 We would make Kissel, Kompot or Mors Juice with all our fruit, and freeze the extras for winter. Mum’s kissel recipe was thick and had the fruit pieces still in it for extra flavour. It was tastier and quicker to make, who wants to strain the fruit through a sieve. I think it’s always best to use what’s in season, unfortunately we don’t have summer year round, luckily kissel tastes just as good using frozen fruit. It’s my bit of summer in a bowl, especially when its cold and rainy/snowy outside. Which brings me to my current locale, sunny, tropical, snow free Australia, where a winter’s day is 19°C/66°F. My homegrown garden has some different berries and fruits from where I grew up. This summer I had my first banana crop ripen. It’s not really a crop, but I had 40 ripe bananas that I had to get creative and experiment with my recipe ideas. Bananas aren’t native to Russia, the banana berry combination works in other meals, so why not try it in a Easy Banana Berry Kissel Recipe? Well guess what, it worked, and I can’t believe I didn’t try this before. Obviously you could make this recipe without the bananas in a more traditional berry kissel recipe, but why would you want to? Bon Appetit! Приятного аппетита! 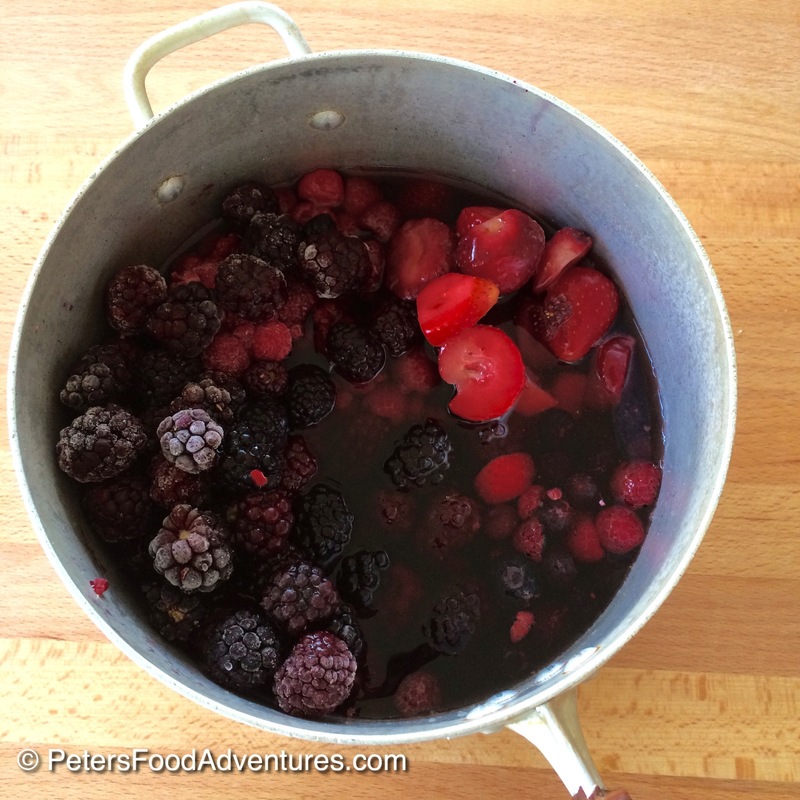 Place the blackberries, blueberries, raspberrries, 3 cups of water and sugar in a medium pot over high heat. Bring to a boil and reduce heat to medium-high and simmer for approx 5 minutes. Add the strawberries and bananas and for approx 3 minutes. The bananas and strawberries keep their shape when cooked quickly. This will give your kissel texture. Taste kissel and add more sugar if necessary. This will depend on the natural sugars in your fruit. Add the potato starch to water in a small jug, and slowly pour into kissel. Stir constantly while kissel thickens (do not stop stirring!). If you want a thicker consistency, add 1 more tablespoon of starch to 1/4 cup of water and repeat process. Remove from heat. Can be served hot or cold in glasses or bowls. Thanks for liking this recipe. It’s so quick and easy to make, and healthy, as it’s just fruit. Adding the banana is just a flavour twist that I really enjoy. Try it and let me know how it goes! Cheers! Oh, I miss kisiel my mum used to make! It would be perfect for our #InheritanceRecipes, feel free to submit. Thanks Margot! I’ll have a look! ??? ?